Although I work mainly on a freelance basis audio proofing and editing now for Common Mode, it was my livelihood for four years during my time at Tantor Audio. Basically, we take the raw audio from the narrator and we run it through a sound editing program - I currently use SoundForge Audio Studio 10 - and we listen through the whole book, reading along with PDF file and highlighting where in the book an error occurs, as well as marking it on an issues sheet with the time, page number, paragraph and line. Oftentimes, we can fix issues along the way, but some issues result in portions of the book - usually only a sentence or two - having to be re-recorded by the narrator (what we call "pickups") and then reintegrated seamlessly back into the audio file. 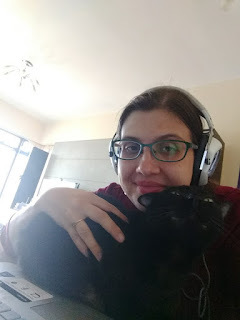 I invited my friend Sunny Basham Carito, an old colleague of mine from our Tantor days and a veteran audiobook proofer and editor, to share her experiences being in the industry, how she came to love what she does, and why editors are such an essential part of getting the product to the point where we can kick back and have an incredible listening experience. My love of audiobooks began while listening to A Series of Unfortunate Events on cassette while driving the 5, the long, horribly dull interstate between LA and San Francisco in California. I was in college but had been reading the series steadily since high school, enjoying the more adult barbs and allusions that would escape the younger set it was marketed towards. While I loved the writing and the tightly composed illustrations, Tim Curry reading the series punctuated by The Gothic Archies songs was sheer genius. Fast forward a couple of years when I was doing post-production sound internships in NYC, trying to find my way after school. I was feeling a bit down about the post-production game, knowing I’d spend 14-16 hour days slogging through commercials and reality TV and other sound work that I couldn’t really put my heart into, being extremely lucky to maybe spend 5% of my time on lovingly creating sonic universes for animation, my big dream. In my internships I worked on two audiobooks in a roundabout way. Amy Goodman was making the audiobook of The Exception to the Rulers from donated studio time and editing; it just needed a bit more polish and work. I was interning in the archiving department at Democracy Now! so they decided to have me go through and pull anything that was a quote from an interview that had been on the show and insert the actual archival audio. It made for a really interesting mix of news clips and searing, high-stakes personal journalism, and I was able to move into working on it for a wage rather than just part of my internship - my first real NYC audio professional paycheck. Trying to find absolutely anything to float me longer in the city, I got another job offer for a strange position I’d applied to on Craigslist at the NLS Talking Books looking for people to record and edit audiobooks for the blind. I didn’t realize this was a full-time gig a person could do; but it was and it was amazing. They liked my theatre background and my ProTools certification; creative plus tech credentials that were less common. It didn’t have the same creative outlet I had been looking for in film, but I was being paid to be read to and I enjoyed the technical aspects. It was also a very regular 9 to 5 kind of a job giving me lots of time to ply my sound design skills for indie stuff on the side. I worked in the studio, engineering recordings with narrators who had been reading for the NLS Talking Books contract longer than I’d been alive. They were consummate actors who put in a couple of hours every day, month after month, working through dozens of titles each year and working in TV, film, and theater the rest of the day. One of them I’d seen on Law and Order at least five different times, all in different random small speaking roles. In the studio I made sure the recording was rolling, stopped it when they stopped, followed along in the text to make sure they didn’t miss anything, and then carefully cue up the recording so when we started again it would sound seamless. I would also work on proofing and editing, proofing being the act of following along with the text while listening to the finished recording to ensure the read is accurate as well as checking pronunciation. The National Library Service reviewed all of our work and they were extremely strict, even typos had to be faithfully recorded. My personal belief is that a “this” in place of a “that” occasionally or a missing “the” may not really make a huge difference, but we’re not text editors, we’re there to bring the book to life audibly and faithfully so we have a duty to the author to not change their text. Unfortunately the studio I worked for was part of the American Foundation for the Blind and they decided to close the studio department for fiscal reasons. This department had created the Talking Books program with the Library of Congress and Helen Keller in the 1930s, they’d invented the 33 1/3rd long playing record ten years before it was adopted by the music industry. Talking Books listeners had grown old listening to the same narrators for decades, but the nature of an unreliable government contract was too hard for AFB to continue and we shut down. Most of my coworkers went across the river to Newark and started working for Audible. 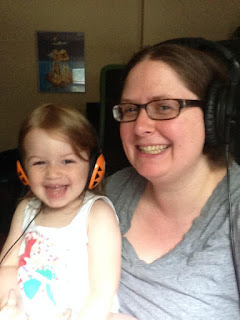 I left the city for Connecticut and freelanced for Audible, proofing, cleaning up noises and pacing, and then inserting the fixes after they were recorded. I started grad school for Library and Information Sciences, taking online classes while working more or less full-time. It was actually working on that Talking Books contract that inspired me. I felt good making books available to people who wouldn’t otherwise have them. Such a small section of books published become commercial audiobooks, and an even smaller section are bought by regular libraries. Everyone should have access to steamy beach reads, so even the borderline erotica had a higher purpose. I knew making information available to people would be my next adventure. I continued to work in audio and go to school, eventually finding myself in a small production firm in Connecticut called Tantor Audio, later to be bought by Recorded Books. After a few years full-time proofing and editing there I moved on to working in libraries, still editing on the side for them and other companies. There were a couple of years when I was very busy at a library when I stopped working on audio, but I’m back now with my preferred lifestyle of part-time children’s librarian and part-time proofer/editor. While mostly I smooth over hiccups in the recording process, mouth noise from microphones not quite aimed correctly, and watch for misreads, I have had the great fortune to work on a few more interesting projects. While I was at Tantor they made two larger bids for high-profile books, a beautiful reading of Timeless Tales of Beatrix Potter by the esteemed late Katherine Kellgren and an intense Richard Pryor biography Furious Cool read by the exquisite Dion Graham. Tantor had the unusual practice of having narrators record themselves using a proprietary software program, but for these recordings they used ProTools and traditional engineering, allowing the “tape” to run as the performers re-did takes, practiced, and stopped for breaths. This wasn’t simply listening for text deviations, it was taking hours of raw materials and pulling out the shining pieces that would form a finished work. I was very proud when Dion went on to win the Audie for Furious Cool. It was well-deserved and I was honored to have put my skill and time into putting the best possible version of his performance on the final work. Katy’s work was nominated as well, and while it didn’t win I highly recommend giving it a listen, she put an extraordinary amount of effort and research into coming up with vintage melodies to weave into the songs interspersing her lively characterizations. Lately I’ve found myself on a number of author records from non-performers. Many of them have done some kind of public speaking, panels and lectures, but reading their personal memoirs in a booth for hours on end is pretty different. The engineers are often newer to the audiobook world and the way the audio jumps back in after a mistake can be jarring for the performer and would be jarring to the listener without proper proofing and editing. For these author recordings more than others, I find myself pulling back the new takes and finding the original pacing of the next phrase, sometimes even stitching a few syllables of the original take to the subsequent one for a smoother sentence. I’m giving them back their personality, their natural manner of speech, that was ruined by the recording process. I’m essential in a way that a software checking for waveform patterns and text could never be. Yes, some people think proofers and editors are unnecessary, some even think they should just leave mistakes in recordings. I love audiobooks and I think performers can take books to another level. I chafe at the idea it’s cheating or not as worthwhile as reading, which has been disproven by neuroscience, but is also contrary to why I like books. I like the information they impart to me, the experiences, not the paper they’re printed on or the format that gets that information to me, just the information. So I read ebooks and listen to audiobooks and still read regular paper books too. Because it’s for the story. I have spent many stretches in my life working an eight-hour day in the audiobook mines only to pop one into my car stereo or on my iPod on the subway for my commute. I love them that much - and when you get to choose what you listen to it is very different. When people ask what it’s like working on audiobook production I say it’s great, I am basically getting paid to be read to, what’s not to like about that? Sometimes the narrator or the book isn’t my cup of tea, but it’s rare for a project to last more than a week or two, so even if I think it’s awful it will pass by soon. But listening at work has opened me up to genres and authors I would have never tried on my own, so the unknown is exciting. I estimate I’ve listened to well over 10,000 hours of audiobooks in my career going on 14 years now. I look forward to the next 10,000 hours ahead of me.